Rory and Zeke take on a case for Gil Harper of Harper Farms. It seems his future plans for events and general business decisions are being leaked to his biggest competitor. There have also been a few instances of sabotage and Gil wants Rory to undercover the culprit responsible before someone gets hurt. Because it is a family business no one is off limits, even his own wife. 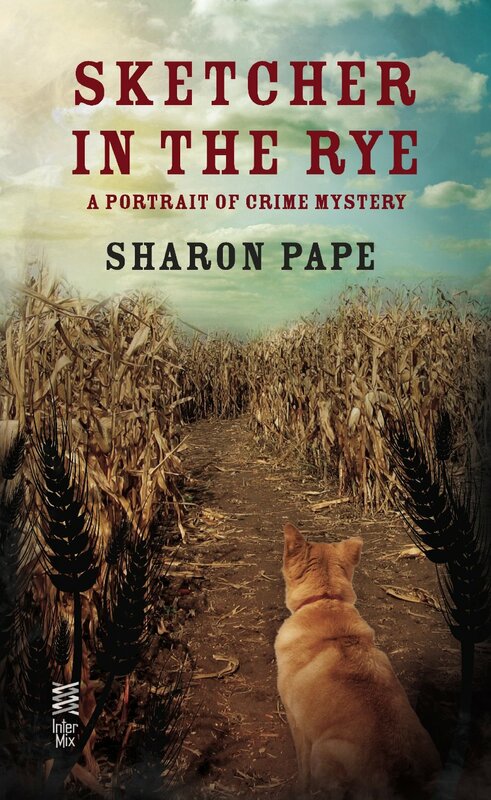 Before Rory can even get started on her investigation she finds the body of the company accountant in the Harper Farms Corn Maze. So now the sketching sleuth has another crime to solve. Rory uses her contacts at the medical examiner’s office and local law enforcement to try to “assist” them catch the killer before anyone else is found dead among the corn stalks. I love the way Sharon Pape writes and she also gives us more than one mystery to solve. In each installment we learn a little more about Marshall Zeke and this time it was pretty significant. Sharon takes us back in time and ties it to the present seamlessly. There are also those little touches – figures of speech or words Zeke is just not totally familiar with – “it must be of those sidekick things” sidekick – psychic – these just crack me up. I do have to say the way the main mystery played out was very surprising. It did bring a few tears to my eyes but I don’t wait to spoil anyone’s enjoyment by telling too much. This is a fantastic story as is the whole series. I highly recommend starting at the beginning to see how the sketch artist and the Marshall came together. Find out more about Sharon and her books here. Check out the rest of the tour for more reviews, guest posts, interviews and giveaways!! !